New Delhi: With India skipper Virat Kohli excusing himself from the ongoing limited-overs series against Sri Lanka to marry girlfriend Anushka Sharma, Rohit Sharma has been leading the team. While Rohit has done a wonderful job in winning the 3-match ODI series 2-1, India will be without Kohli for the first time in a T20I since the 3-match series between India and Zimbabwe in Zimbabwe in June 2016. Since his T20I debut (ironically at Harare against Zimbabwe in 2010, Kohli has played 55 out of the 63 T20Is India have played and is possibly the best all-round batsman (i.e. across formats) in the world at the moment, averaging over 50 in each format. Given Kohli’s absence, the onus is on Rohit to lead from the front. While he has a magnificent record as Mumbai Indians skipper, winning 45 of the 75 games that he has led in at a winning rate of 60%, Rohit has never captained India in a T20I before. But then, Rohit is also the only captain to skipper an IPL team to 3 titles — in 2013, 2015 and 2017. But more than the captaincy, it is the batting that could be the crucial factor for the Indians. Kohli’s shadow looms large when India chase. When India have had Kohli in their team, they have won 19 out of 27 T20I chases (percentage: 70.37%), but without him, it drops to 8 out of 16 (50%). Despite playing fewer innings in chases than Rohit, Kohli has double 12 fifties in the format as compared to Rohit’s 6. 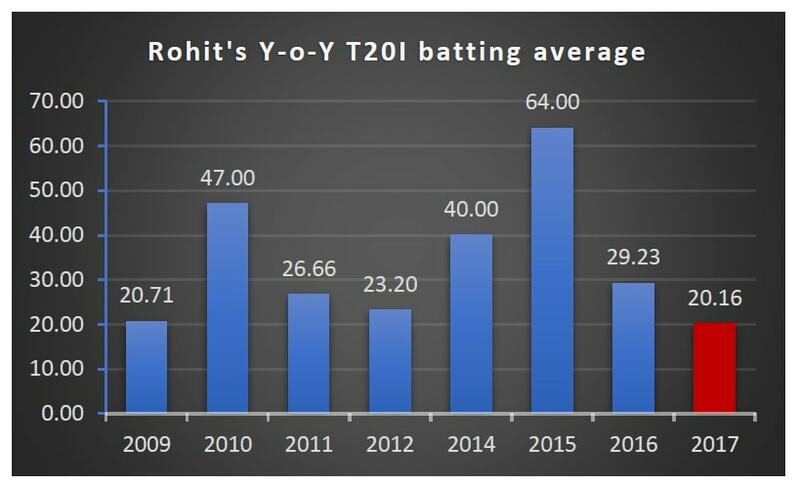 Rohit’s returns in T20Is this year have been poor. He has 121 runs in 6 innings at an average of 20.16 and has 4 single digit scores in these 6 innings. The bench strength is expected to be tested but India are unlikely to lower the intensity when they take on Sri Lanka in a three-match Twenty20 series starting here on Wednesday, aiming to extend their dominance in the shortest format as well. The Test series in pocket, India, without inspirational skipper Virat Kohli, hardly broke a sweat to clinch the one-day series 2-1 and Rohit Sharma and Co. will look to polish off the T20I series on a perfect note. Sri Lanka have been no match to India barring their one- off spectacular bowling effort in Dharmasala in the opening ODI. After India bounced back in Mohali, Sri Lanka had their best chance in Visakhapatnam but they collapsed from 136/1 to be bundled out for 215. A resilient India quickly got into the act after an inspirational stumping by MS Dhoni. This was followed by the spin twin of Kuldeep Yadav and Yuzvendra Chahal running through the Lankan batting to claim three wickets each. However, Twenty20 is a different ball game and India would look for a smooth transition to the shortest format, having endured a batting disaster in the first one-dayer. India do not have happy memories of the solitary T20I at the Barabati Stadium despite the fact that they lead Sri Lanka 7-4 on head-to-head count and are yet to lose against them in the last four outings. India had folded for 92 against South Africa in the lone T20I played here in 2015 as crowd trouble brought infamy to the venue and the hosts would look to give a better account of their batting on Wednesday.